CentrikBlogsBusiness AdvisoryRERA ConsultingJurisdiction of RERA Authority in case of termination of Agreement before Implementation of RERA Act? From July 1, 2017, the Real Estate Regulation and Development Act (RERA) came into force in various States, including large property markets such as Maharashtra and Gujarat that are in the forefront of implementing the legislation. The ambits of the RERA act is not restricted to new projects to be started after the implementation of RERA Act but also covered projects that were ongoing on the date of commencement of the Act and had not received completion certificate from the concerned Authority. 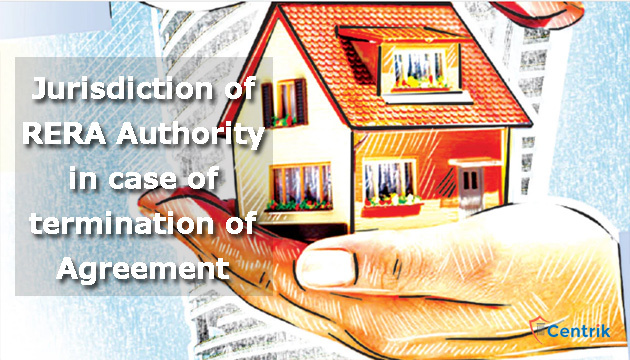 A question of law recently arose before the Maharashtra RERA Authority that whether in cases of termination of agreement before the implementation of RERA Authority, the jurisdiction of the RERA authority is ousted or not? In the case of Chauthiprasad S. Gupta vs M/S Nahalchand Laloochand Pvt. Ltd, the buyer had made substantial payment to the builder and thereto the builder executed and registered a sale agreement for a unit in ‘NL Aryavarta’ at Dahisar (East), Mumbai. As per the buyers’ version, the builder terminated the agreement of sale unilaterally by way of termination letter without giving any opportunity of being heard to the buyer. The builder therefore prayed before the Authority for directions to the builder to withdraw the termination letter and for awarding of interest and compensation. The builder disputed the claim of the buyer on the pretext that the termination of the agreement was done prior to the implementation of RERA therefore the RERA authority lacked the jurisdiction to entertain the present complaint. Further, the builder contended that the termination of agreement was as per the clauses of the agreement hence needs no interference from the Authority. With regard to the jurisdiction issue raised by the builder, the Authority took the view that the project in question falls within the definition of ongoing project and that the project is registered under Section 3 of RERA Act. The jurisdiction of RERA Authority over such projects continues until the projected is completed and the obligations of the promoter regarding the project get fully discharged. The authority therefore decided that the RERA Authority has jurisdiction to entertain such cases. To conclude, the builders today cannot escape their liability by taking shelter under non maintainability of the complaint if the project is registered under the RERA and has not received Occupational/ Completion certificate yet.